We value your feedback and are always looking for ways to improve the services we provide to the UNA community. Please take a moment to answer our 60 second survey. Not good with names? That's okay. Visit Meet Our Staff for names and pictures of our staff. Have you used the Career Center within the last 3 months? To set up an appointment to meet with a Career Center staff member. Inquired about an upcoming event. Reserved tickets to the Etiquette Lunch/Dinner. What staff member primarily assisted you during your visit? Please visit our Meet Our Staff page if you aren't sure who assisted you. This piece is important! The staff member who made my appointment was friendly, courteous and helpful. I did not make an appointment today. The staff member who assisted me during my appointment was helpful and friendly? If you answered disagree or strongly disagree to any of the above questions, please take a moment to let us know how we can improve. If the staff member who assisted you was outstanding, please tell us why. We love hearing from you! How did you learn about Career Center services? Thank you for completing our survey! Please let us know how we can help you in the future! 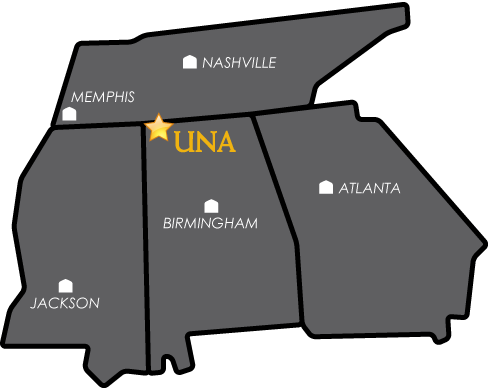 Visit our website career.una.edu for a complete listing of services.